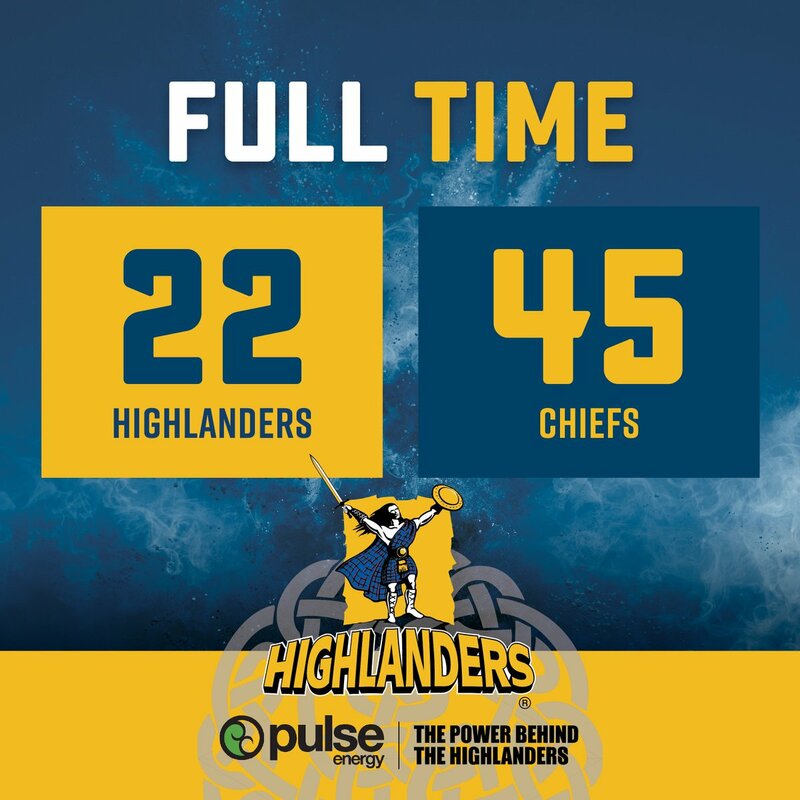 FULL-TIME: The Chiefs have defeated the Highlanders 45-22 in an action-packed game of two halves but where the dominant first 40 minutes by the Chiefs made the difference. Knock on and the Chiefs lose the ball - Ben Smith kicks it into the crowd and the whistle blows to call an end to the action. Knock on to the Chiefs as the siren sounds with play inside the Highlanders 22. Chiefs will want to go for another score. Over the line but the ball is held up and so it will be a scrum five metres out. The Highlanders need another try to deny the Chiefs their Bonus Point. Highlanders get to within a couple of metres of the try line but lose the ball again with a handling error. Strong lineout throw at the halfway line gets the Chiefs into attack mode again heading into the Highlanders half. Kick upfield sees the ball into touch deep in the Highlanders' half and they have the lineout throw. Again the Highlanders make a break but lose the ball in the pass inside the Chiefs half. Damian McKenzie looked to have a run to the line chasing the loose ball but the bounce defied him and it resulted in a knock-on. Highlanders definitely having the bulk of the possession in this half but they have a large deficit to pull back. MISSED CONVERSION! Highlanders - Sopoaga's kick hits the post and deflects away. PENALTY HIGHLANDERS - front row angling in. Stacks-on-the-mill at the try line and the referee declares a scrum 5 metres out. SCRUM FEED HIGHLANDERS with the action now on the 22m line in the Chiefs half. Tevita Li looks to have made a great intercept but the pass from the Chiefs has been ruled to be forward. TRY! Highlanders (Walden) 12-42 ...Tei Walden gets his second. The pace of the action has become frenetic and the crowd have become very vocal. Charlie Natai has a huge run upfield and gets the Chiefs inside the opposition 22 before there is a turnover. Highlanders have definitely come out in the second half with the intention of getting their act together with two potential tries - one awarded - in as many minutes early in the half. NO TRY! - Walden lost the ball forward in the tackle. TMO - another quick try to the Highlanders is being checked for a knock-on in the earlier passage of play. TRY! Highlanders (Tei Walden) 5-42 ... finally the Highlanders are on the scoreboard! 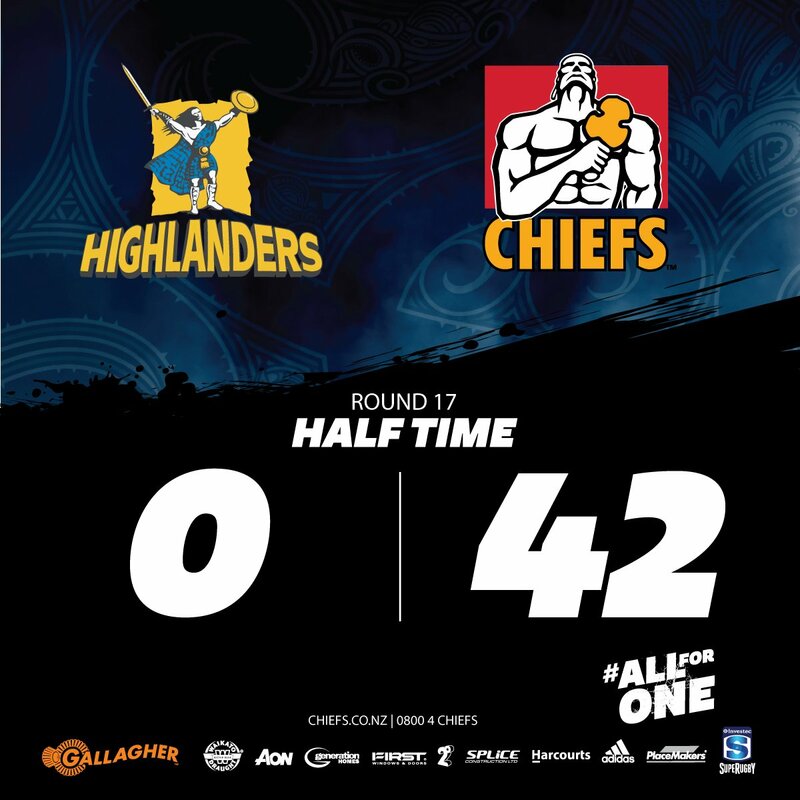 Rare handling error by the Chiefs sees the Highlanders get possession inside the opposition half. Knock on sees a scrum feed to the Highlanders - everyone takes a breath. Second half underway and the Chiefs start as they finished - on the attack. What will the Highlanders bring to the second half to, at the very least, salvage some pride? HALF-TIME: The Chiefs lead the Highlanders 42-0 in what has been an almost perfect half of rugby for the men in white. Complete dominance is the story of the first 40 minutes. Turnover and the Chiefs run it to the line again! Siren sounds as the Highlanders get possession and look to get something on the board before going to the rooms. Damian McKenzie is judging his kicks so well in the strong breeze. PENALTY CHIEFS - not releasing the ball. TMO - Try awarded but touch line to be checked. YELLOW CARD HIGHLANDERS - Luke Whitelock pinged for a deliberate knockdown and is off to the sin bin. PENALTY CHIEFS - high tackle. Chiefs get the turnover and go on the charge again deep into the Highlanders' half. Long, wide passes for the Highlanders consistently going astray. Highlanders with possession but struggling to get the ball out of their own 22 in regular phase play. The Chiefs are carving up the Highlanders in every aspect of the game at the moment. SCRUM FEED CHIEFS - right in front of the posts. Liam Messam making his presence felt in attack for the Chiefs. PENALTY CHIEFS - not rolling away. Ball into touch 10 metres into the Highlanders half - scrum to the Chiefs. But ... Sopoaga fumbles the pass. Chiefs making good ground to the halfway but then it's knocked on to give the Highlanders some rare possession. PENALTY HIGHLANDERS - Sam Cane not rolling away. The Highlander-supporting Fijian crowd is a bit stunned at this start. An unbelievable level of errors from the Highlanders. 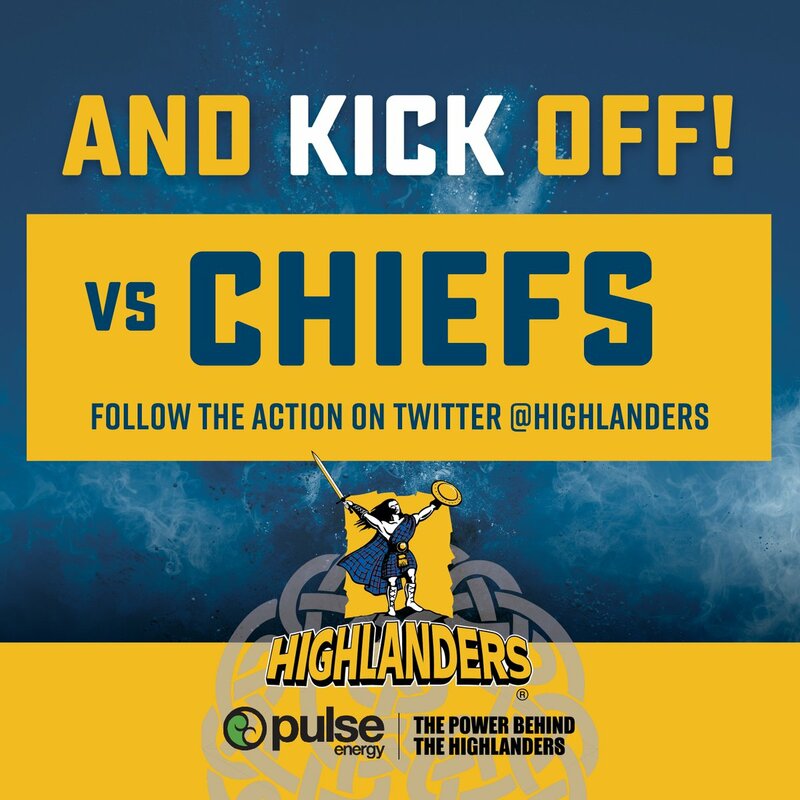 Discipline the key in the first ten minutes of this game - solid from the Chiefs, poor from the Highlanders. Confidence from the Chiefs as they go to the lineout inside 10 metres rather than taking a shot at the posts. The pitch looks lush and green but there are plenty of divets as a consequence of the moisture. That's three early penalties given up by the Highlanders. PENALTY CHIEFS - front row collapsing. Ball lost forward - missed opportunity in attack. Highlanders take the ball inside the opposition 22 looking to answer quickly. The Chiefs go straight into a maul before finally getting the ball out and moving it forward. PENALTY CHIEFS - joining the ruck incorrectly. A big crowd at ANZ Stadium in Suva to watch this Super Rugby clash as the teams run out on the field, the game about to get underway. 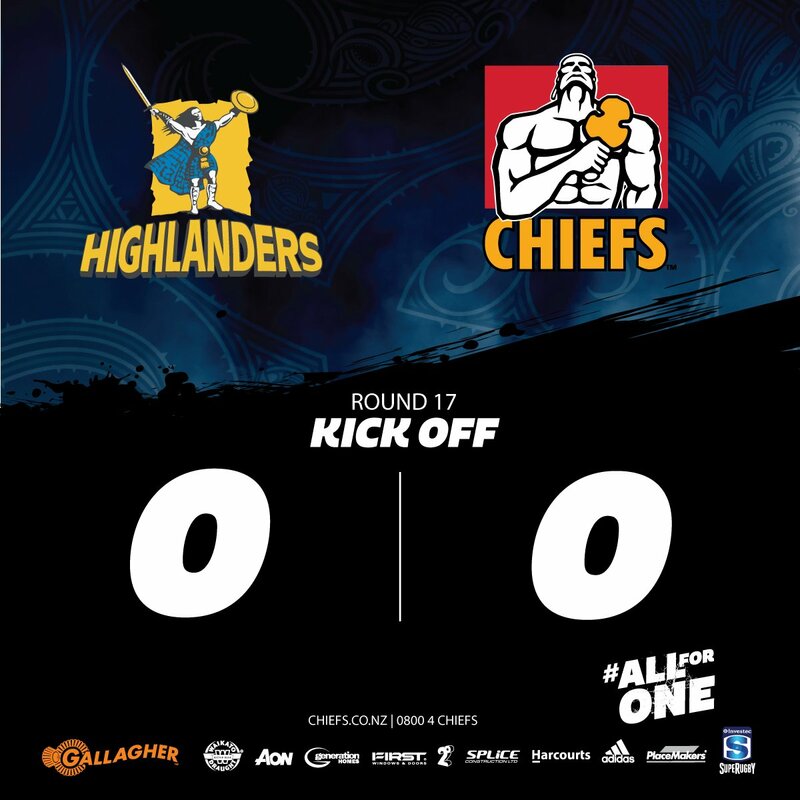 An important match for both teams with a possible finals berth for the Highlanders, while the Chiefs will be looking to continue their recent dominance between the two. Saturday Super Rugby is ready to kickoff with the Highlanders taking on the Chiefs in this special NZ Conference clash taking place in Suva, Fiji. RT @Sam_Warlow: ICYMI: @TheRugbyCorner gave @RugbyPass the lowdown on the first season of @usmlr and where the new league is headed! The Hurricanes and Brumbies will resume their Super Rugby campaigns in 20 minutes. And we're underway here in Suva. The Highlanders and Chiefs are ready to play in Suva. @JamesMcOnie @alistokesrugby @JaxHemopo @jeromekaino @Highlanders @ChiefsRugby @acast @simondangerday Yes, sure Ali, we'd love to.